Carbonyl iron is a highly pure iron, prepared by chemical decomposition of purified iron pent carbonyl. 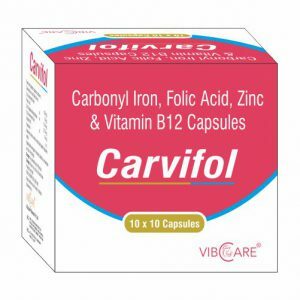 This medication is an iron supplement used to treat or prevent low blood levels of iron (e.g., for anemia or during pregnancy). Zinc in zinc tablets and zinc oral solutions can be in the form of zinc sulfate, zinc gluconate, or zinc acetate, all water-soluble zinc salts. zinc supplementation are used in the management of diarrhoea zinc inhibits cAMP-induced, chloride-dependent fluid secretion by inhibiting basolateral potassium (K) channels Zinc also improves the absorption of water and electrolytes, improves regeneration of the intestinal epithelium, increases the levels of brush border enzymes, and enhances the immune response, allowing for a better clearance of the pathogens. Folic acid is a type of B vitamin used to treat folic acid deficiency and certain types of anemia (lack of red blood cells) caused by folic acid deficiency. Folic acid is sometimes used in combination with other medications to treat pernicious anemia. Folic acid is often used in combination with other B vitamins. Vitamin B12 is used for treating and preventing vitamin B12 deficiency, a condition in which vitamin B12 levels in the blood are too low. It is also used to treat perniciousanemia, a serious type of anemia that is due to vitamin B12 deficiency. Contact with your doctor and pharmacist before taking this medicine. 1) Treat or prevent low blood levels of iron (e.g., for anemia or during pregnancy).